You are here: Home / Natural Fine Planetary Talismans / Noble and Sattvik Sun energies with an exotic Mong Hsu Mine imperial pigeon blood ruby set in Sterling Silver ring. A joyful experience to see a fully natural, non glass filled ruby. Noble and Sattvik Sun energies with an exotic Mong Hsu Mine imperial pigeon blood ruby set in Sterling Silver ring. A joyful experience to see a fully natural, non glass filled ruby. Selected Rings, Pendants and Talismans made available to Gemstoneuniverse.com patrons in January 2011! Comments Ravishing, rare, and totally pure Ruby set in Sterling Silver Ring! This Ruby is from the famed Mong Hsu Mine and is from our latest lot. This photograph was unable to capture the sheer brilliance and vibrancy of this fully natural ruby due to the highly reflective surface of the Gemstone. 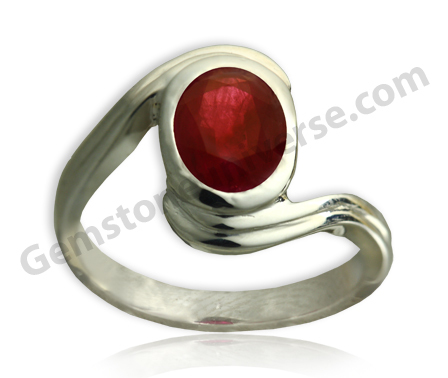 Among all the Navgraha Gemstones, today, Natural Ruby is the most difficult and expensive to procure. The rarity of Natural rubies is incomparable in today’s market condition where 99% of the Rubies in the market have undergone Glass filling to improve clarity. Lovely color and blessed Sun energies in this Burma ruby. 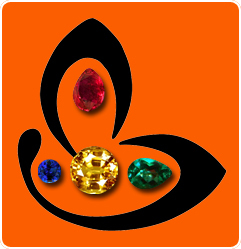 Burma rubies from Mogok and Mon Hsu are most desired due to their deep red color which cannot be matched by a Mozambique Ruby. A 2+ Carats Natural Burma Ruby with great clarity and a price that no one can beat! Click here to view the picture of this natural ruby before it was set in the ring to get an idea about the clarity levels.